Red Baron Bunching Onion adds vibrant color to any dish… from salads and stir-fries to favorite fresh and cooked recipes. 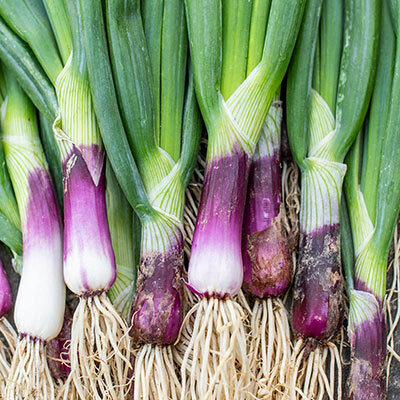 It is a tasty bunching onion that maintains its gorgeous red-burgundy color through all stages of growth-from scallion stage to small bulbs-regardless of weather conditions. It is just as tasty as it is beautiful… ideal for eating fresh, salads, cooking and pickling. For best results, plant bunching onion seed in early spring as soon as the garden soil can be worked. To ensure a continuous supply, sow a new crop every two weeks. Bunching onions can also be planted as a fall crop. 65 DAYS. Spacing: 1 - 2 inches between plants, thin to 2-4 inches apart, 12 - 18 inches between rows. Soil Requirements: Rich, well-drained, sandy loam soil.